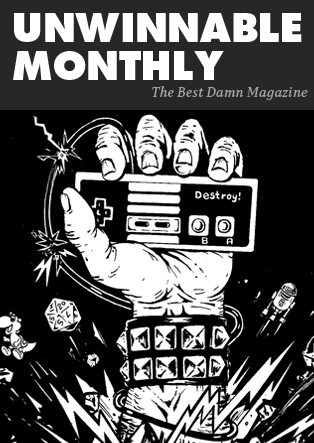 This is a reprint of the Letter from the Editor from Unwinnable Monthly #109. If you like what you see, grab the magazine for less than ten dollars, or subscribe and get all future magazines for half price. Hi gang! Welcome to what is probably our longest issue of the year. It is jam packed, so let me get right to it. 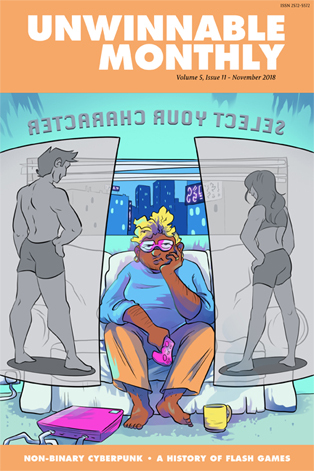 Our cover story this month, by Liam Conlon, tackles the many ways in which cyberpunk as a genre can improve its inclusiveness. Eve Greenwood sums it up nicely on the cover, I think, and you can find more about them in the Artist Spotlight. Our second feature is a massive, thoroughly entertaining, often sweet and always interesting history of Flash games by Phantom. Don’t let the length daunt you. In the columns, Alyse Stanley joins the regulars. She will be contributing a monthly look at the meme-verse. She leads off with Gritty, and it is great. Give her a warm welcome. Amanda Hudgins’ Self Insert also returns this month, taking a look at the enduring appeal of the Marvel Cinematic Universe’s Darcy Lewis in fanfic. There is a smog of zeitgeist hanging over some of our columns. Over in Backlog, Gavin Craig wrestles with a diminishing interest in videogames (I can relate, buddy). Sara Clemens echoes this while musing on vampires and the ethical consumption of games. Which Yussef Cole echoes in his pondering of how to write about ethically compromised games like Red Dead Redemption 2. Taking another tack with RDR2, Jason McMaster examines the game’s pacing and emergent beauty. Rob Rich steps up to try to redeem Brutal Legend’s reputation. Oh, and, speaking of heavy metal, Astrid Budgor’s got some excellent new albums for you to check out. Elsewhere, Megan Condis luxuriates in the gentle tone of the Japanese reality show Terrace House. Deirdre Coyle recalls the odd videogame hidden in her Encarta and gets witchy about it. Ben Sailer gets amped for the Dance Dance Revolution movie. Matt Marrone visits Prince’s Paisley Park. Finally, I think far too hard and long about a recent encounter with the Mysterious Package Company. In other news, we’re close to launching the new official Unwinnable podcast, Unmissable. Sara Clemens and David Shimomura will be your hosts. While you wait on that, check out our other podcasts, Notorious Narratives and The Vintage RPG Podcast. See you on December 1 in the new issue of Exploits!